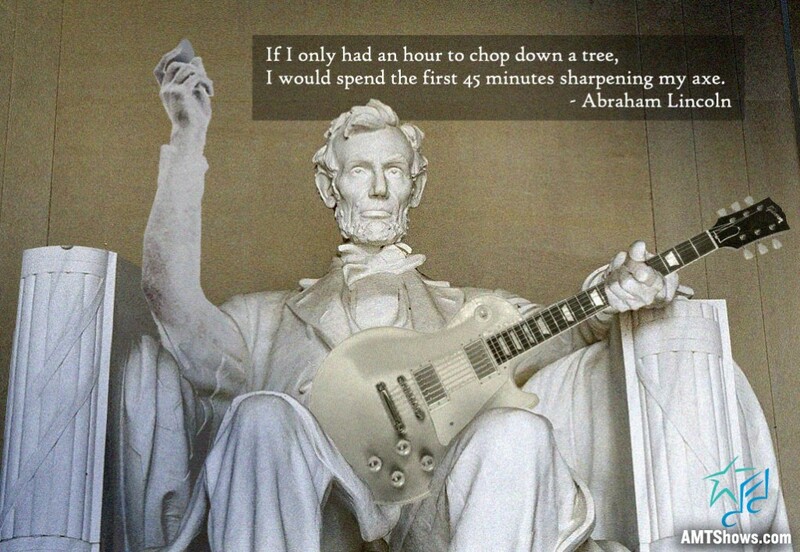 If the Gibson Les Paul existed back then, we tend to think this is the kind of ‘axe’ Abe would be talking about. We can learn a lot from the 16th President of the United States. Throughout his life, he was a small business owner. He owned a small store for a short time. Although it went out of business, he certainly did not let that failure stop him. He went on to run a law practice, invent a device to lift riverboats over sandbars, for which he owned a patent, and, of course, become President of the United States. This Abraham Lincoln quote is often used as motivation and illustration for planning, practice, and strategy. It has been popular across business and personal industries to drive home the point that you need to spend time in preparation, planning, and practice in order to efficiently deliver a solution or result. It has also been used in the productivity, efficiency, and time management spheres. A dull axe, or the wrong tool for the job, will not allow you to work quickly and efficiently to achieve your goal. As with music, you have to put in the time to be great. Practicing your craft over time allows you to deliver incredible performances, craft amazing songs, and continue to grow as an artist. On a more amusing note, as depicted in the image, the Gibson Les Paul is the “axe” of choice for several musicians. The Gibson Guitar Corporation was founded in 1902. Back then, Orville Gibson called the company “The Gibson Mandolin-Guitar Mfg. Co., Ltd.”. In 2013, the company was renamed as “Gibson Brands, Inc.” Though they sell guitars under a variety of brand names, their most iconic model was the Gibson Les Paul. This solid body electric guitar was first sold in 1952. At the time it was released in 1958, the sunburst Les Paul had low production and sales – it was considered a failure. Since then, it was one of the first mass-produced electric solid-body guitars, sharing that title with Fender’s Telecaster and Stratocaster. And, it has been used in a wide range of music genres, from rock to country, reggae and pop, and everything in between. Now, it is one of the best-known electric guitar types in the world. The Gibson Les Paul now comes in several models and variations and continues to be an iconic guitar in the music world.